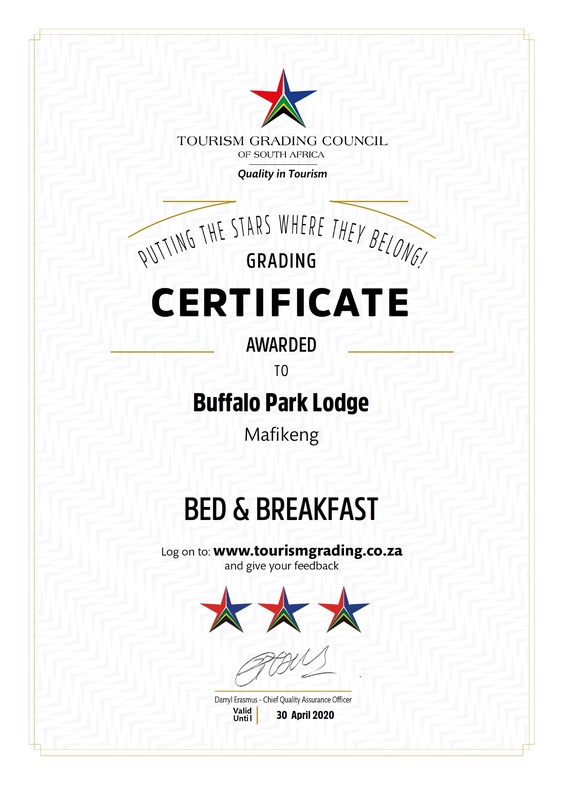 Buffalo Park Lodge is an exclusive guest lodge with a relaxed atmosphere in heart of the capital of the Northwest, Mafikeng. We are 30 minutes from the Mafikeng International Airport and will collect and deliver you on time. We are situated within walking distance from the centre of town and 10 minutes from the shopping malls which will also cater for other requirements you might have. When traveling, may it be on vacation, a business trip or just exploring our beautiful outdoors, we will see to your every need. Twenty three tastefully furnished en-suit rooms with DSTV and air-conditioning caters for everybody’s needs. We offer the warmest atmosphere, total comfort and generous hospitality to the weary traveler and tourist. RESTAURANT/BAR The restaurant offers a large A-la-carte menu which will satisfy even the most particular pallet. 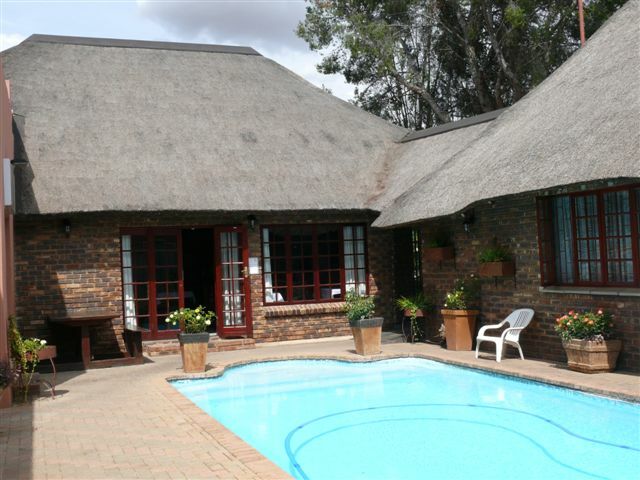 The lodge is famous for its outstanding steaks and traditional lamb knuckle and oxtail potjies. Our tasty and traditional breakfast buffet will ensure that you keep up through the day. The cozy bar compliments the relaxed atmosphere. 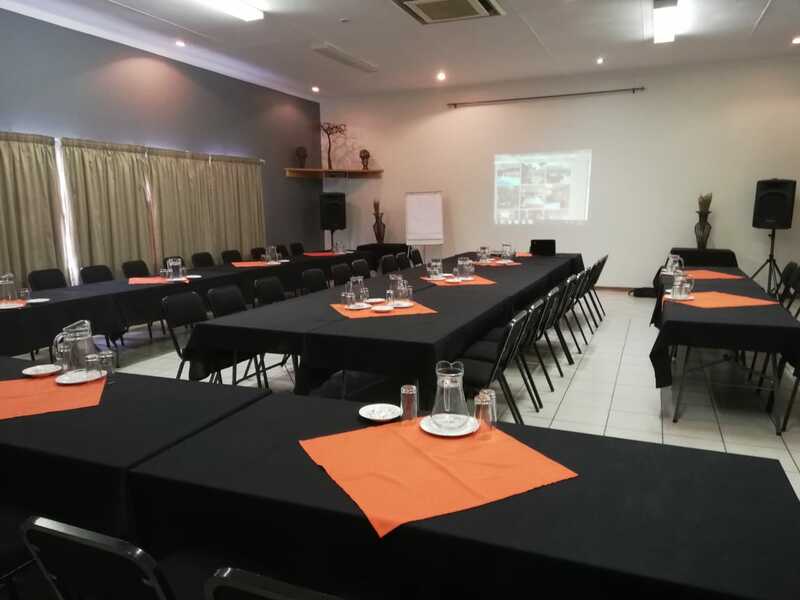 Our conference centre caters for groups of 20 and up to 60 delegates and offer buffet meals to compliment the activities. The facility is fully equipped with projectors, flip charts and tv.